The compact design of our DRC.. electronic motor combines integrated electronics with a permanent-field synchronous motor to offer the ideal solution for decentralized applications where maximum gear unit flexibility is a must. When coupled with a highly efficient helical, helical-bevel, or parallel-shaft helical gear unit or used as a stand-alone motor, the DRC.. electronic motor is a high-performance, decentralized drive unit. 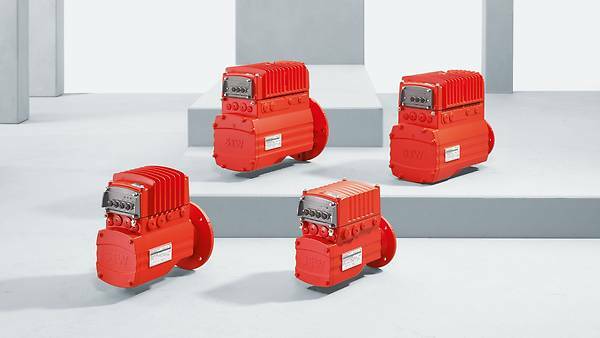 The DRC.. electronic motor comes in the same communication variants as MOVIGEAR®, and is available in four sizes with power ratings from 0.55 kW to 4 kW. This enables the achievement of continuous torques of 2.6 Nm or 19.1 Nm. These features and the seamlessly integrated components make the DRC.. electronic motor an intelligent mechatronic drive system that offers high levels of reliability and endurance. This guarantees high system availability and ensures maximum operational reliability. Its practical flexibility, high energy efficiency, and exceptional performance make the DRC.. electronic motor a cost-effective, forward-looking solution that is perfect for your needs. Thanks to its unique design and IE4 energy efficiency rating, the flexible, universal electronic motor is used on a global scale for a range of supply voltages between 380 V and 500 V at 50/60 Hz.